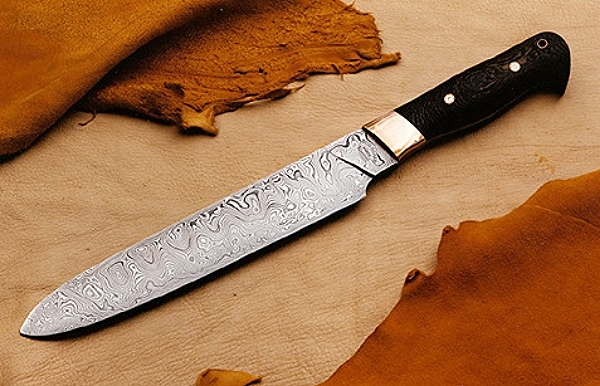 Bud Nealy is recognized as one of the top knifemakers in the world. He is best known for his patented MCS (Multi-Concealment Sheath) System – a sheath fabricated from kydex (an ABS/acrylic alloy) which can be fitted with any one of five attachments offering nine different carry positions. Hundreds of his MCS System knives are carried daily by plainclothes police, undercover agents, members of S.W.A.T. and R.A.I.D. teams, U.S. Embassy guards, executive protection and EMT personnel, newspaper reporters and others who work in or travel to unsafe neighborhoods. In addition to the knife models that utilize the MCS System, Bud designs and makes a variety of “outdoor” knives (used for such sports as hunting, fishing, sailing, backpacking, mountain biking, extreme skiing, canoeing, etc.). Other designs of Bud’s include kitchenware, carving sets, and highly finished collector’s pieces. All of Bud’s knives are made by hand from the finest steels available, including CPM 154, a state of the art, crucible particle melt stainless, and S30V, a corrosion resistant, particle melt steel. They are handled in a variety of materials ranging from the “workhorse” utilitarian, Grip-Guard G-10, to exotic woods, pearl, animal horn, etc. Bud‘s knives are included in the collections of musicians/performers Deborah Harry, Bobby Rondinelli of Black Sabbath, Grammy nominated/award-winning jazz artists Dave Liebman and Phil Woods and Steve Tyler and Joe Perry of Aerosmith. Actor Scott Glenn owns one as does the director, Terry Gilliam, and Saturday Night Live producer, Jim DeAngelis. One of Bud‘s knives was used in a ”Father Dowling Mystery” segment, another is owned by Judge Lance Ito (of O.J. fame) and Bud‘s 5” Kinzhal is the personal carry of Major General Aleksandr Korzhakov, Head of the KGB in the Soviet Union under Boris Yeltsin.